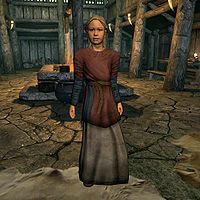 Eirid is a Nord child living in Winterhold. Her parents are Haran and Dagur, and they run The Frozen Hearth inn. She wanders the inn from 8am to noon, goes outside to play till 6pm then returns to the inn and sleeps in the basement at night. Eirid wears red colored child's clothes and a pair of shoes. She carries a selection of food and toys and a small amount of gold. She'll tell you that with Winterhold being largely vacant, Assur is the only one her age to play with. "There's not many people left in Winterhold, so I only have Assur to play with, and sometimes he's mean." She'll explain why she thinks so. "He always wants to play 'Hunt the Elf', and he makes me be the elf." She also has a few comments about the College of Winterhold: "Assur says his pa says the College made lots of bad things happen, but the mages I've seen look nice." and "The mages don't let us go in the College. They said it's not safe in there." Sometimes, she may tell you, "Assur and I are playing a game. Don't tell him where I am!" Should the Imperial Legion take over Winterhold, Assur and his family will be exiled. Eirid can be found commenting on this. "Assur had to move away because of the Empire. But we get to stay." Should you talk to Eirid during Containment, where Winterhold is disrupted by Magic Anomalies, she will be scared. "Did you make something bad happen?" Haran: "I understand Eirid's been playing 'Hunt the Elf' again." Dagur: "It's just children playing, Haran. I wouldn't fret over it." Haran: "I'm not 'fretting.' I don't want Eirid playing those sorts of games!" Dagur: "All right, all right. I'll speak to her." This page was last modified on 22 April 2019, at 00:08.